For over 50 years, the urology specialists at UCLA have continued to break new ground and set the standards of care for patients suffering from urological conditions. Our acclaimed physicians and researchers have received a number of awards and achievements over the years, distinguishing our faculty and the UCLA Department of Urology as a leader in the treatment of urological disease. Some of our most recent distinctions include the following awards and honors bestowed upon our faculty and trainees. Robert Reiter, MD, UCLA Urology’s Bing Professor of Urology and Molecular Biology and director of the Prostate Cancer Treatment and Research Program, is a visiting professor lecturer at the 12th annual Lorne D. Sullivan Lectureship and Research Day at the University of British Columbia. Leonard S. Marks, MD, UCLA Urology professor, had his manuscript “Focal Therapy Eligibility Determined by Magnetic Resonance Imaging/ Ultrasound Fusion Biopsy” published in the February 2018 issue of the Journal of Urology and featured on the cover of the journal. Jamal Nabhani, MD, UCLA Urology fellow, had his manuscript entitled “Health Changes in Low-Income Men Transitioning from a State-funded Prostate Cancer Program to Comprehensive Insurance” accepted for publication in the Journal of Urology. His abstract “Immediate and Temporal Changes in Urologic Surgery in Kentucky after the Affordable Care Act” was accepted for a podium presentation at the American Urological Association’s 2018 Annual Meeting in San Francisco in May. Kathy Huen, MD,UCLA Urology resident, won first place in the American Urological Association Western Section’s history essay contest for her essay entitled “The First Filmed Prostatectomy, 1917: 100 Years of Movies in Urological Education.” She also had a manuscript of the same name published in the journal Urology. Nishant D. Patel, MD, UCLA Urology assistant professor, published “Computerized Tomography Based Diagnosis of Visceral Obesity and Hepatic Steatosis Is Associated with Low Urine pH,” which was highlighted on the cover of the November 2017 issue of the journal Urology. Ja-Hong Kim, MD,associate professor in UCLA Urology’s Division of Pelvic Medicine and Reconstructive Surgery, was selected to participate in the 2018 UC Women’s Initiative for Professional Development. Dr. Kim will be joining a select group of mid-career women made up of staff and faculty/academic personnel from across the University of California system. The program, sponsored by the UC President’s Office and the Systemwide Advisory Committee on the Status of Women, is designed to elevate women in leadership at the university. Isla Garraway, MD, PhD, UCLA Urology associate professor, received a 2017 PCF Challenge Award from the Prostate Cancer Foundation to support her group’s prostate cancer research. Tonye Jones, MD, UCLA Urology resident, received an NIH/National Medical Association (NMA) Travel Award to attend the NMA Annual Convention and Scientific Assembly in July. Allan Pantuck, MD, MS, UCLA Urology professor, was invited to be the only urology presenter at the September 19 U.S. Food and Drug Administration Oncology Drug Advisory Committee meeting considering the marketing approval of Sutent as the first drug to successfully demonstrate a decreased risk of cancer recurrence after surgery for patients with high-risk kidney cancer. Richard Ehrlich, MD, UCLA Urology professor emeritus, had his Holocaust Archives Portfolio accepted into the permanent collection of the J. Paul Getty Museum. Stanley Frencher, Jr., MD, MPH, UCLA Urology assistant professor and director of urology at Martin Luther King, Jr. Community Hospital, was honored at the Celebrate Life Cancer Ministry Community Service Awards event in August. James Lau, MD, has been promoted to UCLA Urology volunteer clinical professor. Dr. Lau has volunteered his time training urology residents at Olive View-UCLA Medical Center for more than 25 years and continues to be a critical part of UCLA Urology’s teaching program. Nishant Patel, MD, UCLA Urology assistant professor, placed first in the clinical category of the Endourological Society’s annual fellowship essay contest for his paper entitled “CT-based diagnosis of low vertebral bone mineral density is associated with hypercalciuria and hypocitraturia on opportunistic imaging,” and was invited to present the paper at the 35th World Congress of Endourology in Vancouver in September. Dr. Patel received the 2017 Cleveland Clinic Educational Foundation Excellence in Teaching Award from the Cleveland Clinic Foundation. The UCLA Kidney Transplant Program was the busiest transplant program in the nation for the year ending April 30, 2017, performing 334 transplants. Andrew Goldstein, PhD, UCLA Urology assistant professor, has been awarded a research scholar grant from the American Cancer Society to fund his work in prostate cancer. Dr. Goldstein is also on the faculty of UCLA’s Department of Molecular, Cell and Developmental Biology, and is a member of the UCLA Broad Stem Cell Research Center and Jonsson Comprehensive Cancer Center at UCLA. Tonye Jones, MD, UCLA Urology resident, was awarded Best Abstract for her role in Focal Therapy of Prostate Cancer: Defining Appropriate Treatment Margins Using MRI: Whole Mount Co-Registration, presented at the plenary session of the 2017 American Urological Association annual meeting in Boston. Andrew Lenis, MD, UCLA Urology resident, had manuscripts published in the Journal of Urology and Urology Practice. He presented a podium talk at UCLA’s Longmire Scientific Day in March. Janine Oliver, MD, UCLA Urology fellow, was the lead author of “Complete Excision of Sacrocolpopexy Mesh with Autologous Fascia Sacrocolpopexy,” published in the journal Urology and co-authored by Dr. Oliver’s Female Pelvic Medicine and Reconstructive Surgery colleagues Zaid Chaudhry, MD, Andrew Medendorp, MD, Lauren Wood, MD, Z. Chad Baxter, MD, Ja-Hong Kim, MD, and Shlomo Raz, MD. Dr. Oliver and Dr. Raz co-authored “Suprameatal Urethrolysis with Martius Flap for Refractory Bladder Outlet Obstruction Following Stress Incontinence Surgery in Females,” which has been accepted for publication in the journal Neurourology and Urodynamics. Karim Chamie, MD, MS, UCLA Urology assistant professor, was recognized as an outstanding reviewer for the journal Cancer. Stanley K. Frencher, Jr., MD, MPH, UCLA Urology assistant professor and director of urology at Martin Luther King, Jr., Community Hospital, has won the Herbert W. Nickens Faculty Fellowship from the American Association of Medical Colleges. The award recognizes an outstanding junior faculty member who has demonstrated leadership in addressing inequities in medical education and health care; demonstrated efforts in addressing educational, societal, and healthcare needs of racial and ethnic minorities; and is committed to a career in academic medicine. Albin Gritsch, MD, received a 2017 UCLA Exceptional Physicians award for his outstanding commitment to patients and demonstration of UCLA values: Compassion, Respect, Excellence, Discovery, Integrity, and Teamwork. Gladys Ng, MD, MPH, UCLA Urology assistant professor, received a prestigious 2017 DGSOM Teaching Humanistic Care at the Bedside Award. Each year, eight faculty members from the David Geffen School of Medicine at UCLA are nominated and selected by their peers for recognition of their outstanding humanistic care of patients. Awardees receive a monetary prize and participate in a series of small group meetings to optimize the teaching of these skills to medical students, residents, and fellows. Christopher Saigal, MD, MPH, UCLA Urology professor and vice chair, was nominated to the National Quality Forum Shared Decision Making Action Team and co-chaired the Decision Aids Certification Panel. Nicholas Smith, MD, UCLA Urology resident, received the 2017 Excellence in Teaching with Humanism Residents and Fellows Award. The award recognizes residents and fellows who model exemplary behavior toward medical students. Dr. Smith also received a 2017 Urology Care Foundation Residency Research Award for his project, “Automated Bladder Cancer Tracking Program as a Means of Improving Delivery of Cancer Care at a VA Hospital.” His mentors were UCLA Urology faculty members Jeremy Shelton, MD, MSHS, and Christopher Saigal, MD, MPH. UCLA Urology residents Claire Burton, MD, Vishnukamal Golla, MD, Rajiv Jayadevan, MD, and Steven Mills, MD, received the Consultant of the Semester Award from The UCLA-Ronald Reagan/Olive View Emergency Medicine Residency Program. The award, based on nominations from residents and faculty within the program, recognizes their excellent patient care. Andrew Goldstein, PhD, UCLA Urology assistant professor, received a Margaret E. Early Medical Research Trust grant to investigate the role of NAD salvage enzymes in prostate cancer. David Johnson, MD, MPH, UCLA Urology fellow, received a 2017 Urology Care Foundation Research Scholars Program grant for his project entitled, “The Effect on Hospital System Finances of Episode-Based Bundled Payments for Patients Undergoing Radical Prostatectomy: The Business Case for Value Based Cancer Care Redesign.” He received a prestigious fellowship with the National Clinician Scholars Program, which offers unique clinical and community-based research training through intensive mentorship for clinicians as change agents driving policy-relevant research and partnerships to improve health and health care. Dr. Johnson is mentored by Christopher Saigal and Mark S. Litwin. Nicholas Smith, MD, UCLA Urology resident, received a $25,000 HH Lee Research Grant for his project entitled, “Automated Bladder Cancer Tracking Program as a Means of Improving Delivery of Oncologic Care at a VA Hospital.” He will be mentored by Jeremy Shelton. Nicholas Donin, MD, UCLA Urology fellow, has had two recent publications related to his group’s studies of a new investigational reverse thermal gel. These studies have laid the foundation for a new clinical trial, the OLYMPUS Trial, which will open soon at UCLA. Dr. Donin co-authored “Immunotherapy for the treatment of urothelial carcinoma,” which was featured on the cover of the Journal of Urology and AUA News. The article reviews immunotherapy for bladder cancer and includes a discussion of many of the new blockbuster immunotherapy drugs. Stanley K. Frencher, Jr. MD, MPH, UCLA Urology assistant professor and director of urology at Martin Luther King, Jr. Community Hospital, presented “Living the Dream: Addressing Health Disparities Through Research and Quality Improvement on the MLK Medical Campus” as UCLA’s 2017 AOA He spoke at a combined Grand Rounds for medicine and surgery during residency Match Week in March. Andrew Goldstein, PhD, UCLA Urology assistant professor, was an author on “Low CD38 identifies progenitor-like inflammation- associated luminal cells that can initiate human prostate cancer and predict poor outcome” in Cell Reports. Mark S. Litwin, MD, MPH, UCLA Urology chair, received the 2017 Community Service and Praxis to Diversity, Equity, and Inclusion Award from the UCLA Academic Senate Committee on Diversity and Equal Opportunity in recognition of his contributions to fostering a diverse, equitable, and inclusive UCLA. Jennifer Singer, MD, UCLA Urology associate clinical professor, was appointed as the inaugural holder of the newly endowed Peter Starrett Term Chair in Medical Education. This position was created through the generosity and visionary leadership of Peter and Cam Starrett and also made possible through support from the David Geffen School of Medicine at UCLA Dean’s Office. Andrew Lenis, MD, UCLA Urology resident, was a recipient of the 2016 American Urological Association (AUA) Urologic Oncology Symposium travel award for the AUA's 2016 annual meeting in San Diego. He was an author on "Association between number of endoscopic resections and utilization of Bacillus Calmette- Guérin for high-grade, non-muscle invasive bladder cancer," published in the journal Clinical Genitourinary Cancer and featured in UroToday. Leonard S. Marks, MD, UCLA Urology professor, co-authored "Focal laser ablation of prostate cancer: Phase I clinical trial," which appeared on the cover of the July issue of Journal of Urology. Christopher Saigal, MD, MPH, UCLA Urology professor and vice chair, participated in the National Quality Forum's Surgical Quality Measures Steering Committee in August as a committee member. UCLA's hospitals have been recognized on the Honor Roll of U.S. News & World Report's "Best Hospitals 2016-17," and UCLA Urology ranked No. 3 nationally. UCLA is ranked No. 1 in Los Angeles, No. 1 in California, and No. 5 in the nation. For the 27th consecutive year, UCLA was named "Best in the West." The Best Hospitals Honor Roll highlights medical centers that placed in the top tier in at least six of the 16 specialties in which U.S. News ranks hospitals. Andrew Lenis, MD, UCLA Urology resident, received funding from the H&H Lee Surgical Resident Research Scholars Program for his research year. Arnold Chin, MD, PhD, UCLA Urology assistant professor, was senior author on "Biased Expression of the FOXP3?3 Isoform in Aggressive Bladder Cancer Mediates Differentiation and Cisplatin Chemotherapy Resistance," published in Clinical Cancer Research. Arnold Chin, MD, PhD, UCLA Urology assistant professor, was appointed to a three-year term on the American Urological Association's Laparoscopic, Robotic, and New Surgical Technologies Committee. Tonye ("TJ") Jones, MD, UCLA Urology resident, received a 2016 Excellence in Teaching with Humanism Residents and Fellows Award. The award, created and presented by the David Geffen School of Medicine at UCLA student body, recognizes residents and fellows who model exemplary behavior toward medical students and other members of the healthcare team. UCLA Urology faculty members Steven Lerman, MD, and Jesse N. Mills, MD, director of the Men's Clinic at UCLA, were nominated as 2016 UCLA Exceptional Physicians. Christopher Saigal, MD, MPH, UCLA Urology vice chair, was nominated to the National Quality Forum's expert panel on decision aids, which will work to set national standards to certify decision aids in healthcare. UCLA Urology residents Andrew Lenis, MD, and Matthew Pollard, MD, received H. and H. Lee Surgical Research Scholars Grants for the 2016-17 academic year in the amount of $25,000. UCLA Urology faculty members Allan Pantuck, MD, and Arie Belldegrun, MD, co-authored “Genomic characterization of sarcomatoid transformation in clear cell renal cell carcinoma,” with former UCLA Urology resident Brian Shuch, MD, in the Proceedings of the National Academy of Sciences of the United States of America. Hung-Jui “Ray” Tan, MD, UCLA Urology fellow, and Mark S. Litwin, MD, MPH, UCLA Urology chair, published “Burden of geriatric events among older adults undergoing major cancer surgery” in the Journal of Clinical Oncology. The 18-month study brought to light issues related to frailty and reduced functionality, conditions of the elderly that tend to be overshadowed by more common objects of study, such as survival rates and chemotherapy toxicity. Alan Kaplan, MD, UCLA Urology resident, was selected to present his abstract in the Early-Career Investigators Showcase at the American Urological Association annual convention in San Diego this May. Dr. Mark Litwin (left) and Dr. David Penson (right). 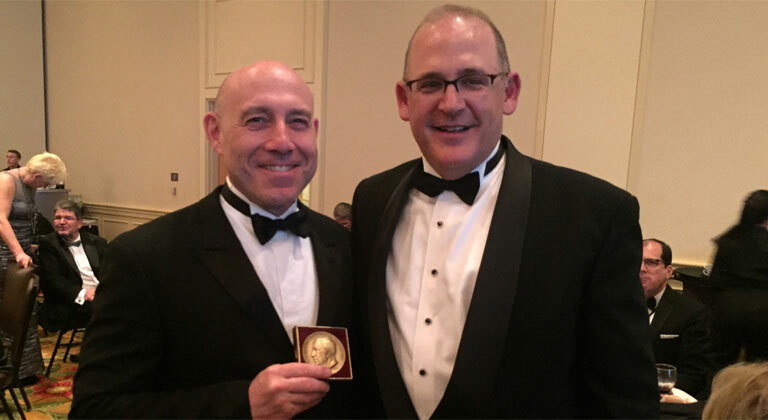 On April 8, 2016 Dr. Mark S. Litwin, Professor and Chair of the Department of Urology, was awarded the prestigious Barringer Medal from the American Association of Genitourinary Surgeons. Dr. Litwin is the 35th recipient of the award, which is named for the first chief of urology at Memorial Sloan Kettering Cancer Center. It was first given in 1955 to Nobel Laureate, Dr. Charles Huggins. In making the award presentation, Dr. David Penson, Chair of Urology at Vanderbilt and a former UCLA urology trainee, cited Dr. Litwin's work focusing on quality of life in prostate cancer survivors and motivating a generation of urologists to pursue careers as surgeon-scientists in health services research. Previous recipients of the Barringer Medal include three former UCLA Chiefs of Urology: Willard Goodwin (in 1978), Joseph J. Kaufman (in 1986), and Jean deKernion (in 2000). A. Lenore Ackerman, MD, UCLA Urology fellow, won the Basic Science Poster Prize at the Society of Urorodynamics, Female Pelvic Medicine & Urogenital Reconstruction annual meeting in New Orleans. Arie Belldegrun, MD, has received the prestigious Whitmore Award and Lectureship. The Willet F. Whitmore Jr. Lectureship was established in 1993 as a keynote address to be delivered at the American Urological Association’s annual meeting and as a tribute to Dr. Whitmore, who embodied the field of urologic oncology as a premier urologic surgeon and a pioneer in the multidisciplinary aspects of urologic care. Jonathan Bergman, MD, UCLA Urology assistant professor, has been selected to participate in the American Urological Association’s two-year leadership program, for urologists from around the country who have demonstrated effective leadership skills within organized medicine or their community. Alan Kaplan, MD, UCLA Urology resident, received two prestigious funding awards for the 2016-17 academic year: an American Urological Association Research Scholar Grant in the amount of $25,000, and a Urology Care Foundation Data Grant, also for $25,000. Joseph Shirk, MD, UCLA Urology resident, won the American Urological Association’s Western Section Resident Bowl and will represent the Western Section at the annual meeting this May in San Diego. Jacob Rajfer, MD and Jesse N. Mills, MD received $50,000 from AMS in support of the department’s andrology fellowship. This is the third year that AMS has supported the program. Andrew Behesnilian, MD, UCLA Urology resident, had the article he co-authored, “Fluorescent image-guided surgery with an anti-prostate stem cell antigen (PSCA) diabody enables targeted resection of mouse prostate cancer xenografts in real-time,” accepted for publication in Clinical Cancer Research. The article describes the potential for a molecularly targeted fluorescent probe to be used for image-guided prostate cancer surgery. His UCLA Urology faculty mentor and co-author was Dr. Robert Reiter. Shlomo Raz, MD, published Atlas of Transvaginal Surgery, a practical surgical atlas covering reconstructive procedures in vaginal surgery. The book provides step-by-step descriptions of commonly performed and recent surgical techniques in the treatment of urinary incontinence, vaginal prolapse, vesicovaginal fistula and urethral diverticula, including 19 videos that provide live details of the operations. Victoria Scott, MD, UCLA Urology resident, had her research-year project, “Intracellular bacterial communities: A potential etiology for chronic lower urinary tract symptoms,” featured on the cover of the September 2015 issue of the journal Urology. UCLA Urology faculty co-authors include Drs. David A. Haake, Bernard M. Churchill, and Ja-Hong Kim. Seth A. Cohen, MD, UCLA Urology fellow, has been selected to serve on the American Urogynecologic Society’s Clinical Practice Committee in 2015-2016. The committee brings together urologists and urogynecologists in efforts to manage the guidelines and clinical practice statements authored for and promoted by the society to its thousands of members nationwide. Seth A. Cohen, MD, UCLA Urology fellow, had a video abstract entitled “Cystocele Repair Using Autologous Iliotibial Band” accepted for oral presentation at the American Urogynecologic Society’s 36th Annual Scientific Meeting, to be held in Seattle in October. The video demonstrates a new technique for native tissue repair of cystocele, devised and refined by Dr. Shlomo Raz and his UCLA Urology team. Christopher Filson, MD, a UCLA Urology fellow who is now assistant professor of urology at Emory University, had his manuscript, “Expectant management for men with early stage prostate cancer,” appear on the cover of the August 2015 issue of CA: Cancer Journal for Clinicians. The article, co-authored with Drs. Leonard Marks and Mark S. Litwin and available online, is the most comprehensive report yet on active surveillance for men with prostate cancer. Joseph Shirk, MD, UCLA Urology resident, received third place in the Western Section American Urological Association 91st Annual Meeting History Essay Contest for his entry, “The Dark Side of Mary Poppins: How ‘Chimney Sweeps’ Cancer’ Led to the Discovery of Carcinogens.” Dr. Shirk will present his essay during the meeting in October. Alan L. Kaplan, MD, UCLA Urology resident, received a Resident Scholar Award from IVUmed and the AUA Western Section to travel to Dakar, Senegal this summer, where he will be under the mentorship of local university urologists. Alan L. Kaplan, MD, UCLA Urology resident, was awarded best poster at the American Urological Association annual meeting’s Epidemiological Trends session in May. Dr. Kaplan’s abstract, “Observing shared decision-making in the urology clinic: A pilot study among men with prostate cancer,” was a product of his research year under the mentorship of Christopher Saigal, MD, MPH, senior author of the study. Carol Bennett, MD, clinical professor of urology, was the 2015 recipient of the “Secretary’s Coin” from US Secretary of Veterans Affairs Robert McDonald for her work promoting patient- centered care. Jonathan Bergman, MD, MPH, assistant professor of urology and family medicine, was a 2015 recipient of the David Geffen School of Medicine at UCLA Excellence in Education Award. This peer-reviewed award was established to recognize outstanding dedication, innovation, and sustained excellence in clinical and classroom teaching. Seth A. Cohen, MD, UCLA Urology fellow, will serve a two-year term, 2015-2017, on the American Urological Association’s National Medical Student Curriculum Committee. His efforts will focus on revamping/revising the curriculum with a new online educational interactive case format. Isla Garraway, MD, PhD, associate professor of urology, was selected to participate as an organizer of the 2016 American Association for Cancer Research Annual Meeting Scientific Program Committee. Stuart Holden, MD, clinical professor of urology and associate director of the UCLA Institute of Urologic Oncology, was appointed as the inaugural holder of the newly established Spielberg Family Chair in Urologic Oncology. Ja-Hong Kim, MD, associate professor of urology and associate director of the Female Pelvic Medicine and Reconstructive Surgery Fellowship Program, was selected as a David Geffen School of Medicine at UCLA Exceptional Physician for 2015, recognizing her commitment to patients and demonstration of UCLA values: compassion, respect, excellence, discovery, integrity, and teamwork. Aaron Laviana, MD, UCLA Urology resident, was the project lead on “Small Renal Masses,” a winner of the UCLA Institute for Innovation in Health “Putting the Patient’s Voice into Actions” contest. The project, which also included team members Sylvia Lambrechts, MPH, MA, Annette Ilg, and Christopher Saigal, MD, MPH, interviewed patients with small renal masses to better understand which factors are most important to them when choosing a specific treatment. Robert Reiter, MD, received funding from the Department of Defense’s Prostate Cancer Research Project Synergy Award for his grant, “Multifunctional PSCA Antibody Fragments for PET and Optical Prostate Cancer Imaging,” which will study the use of Prostate Stem Cell Antigen (PSCA) to detect prostate cancer. Eric Miller, MD, UCLA Urology resident, and Matthew Rettig, MD, professor of medicine and urology, received 2015 Jerry Janger Memorial Seed Grants. Dr. Miller, who will work in the laboratory of Isla Garraway, MD, associate professor of urology, focuses on identifying mechanisms that can be targeted for the prevention and treatment of lethal, bone metastatic prostate cancer. Dr. Rettig is developing a “nano-chip” to detect and isolate rare cancer cells that circulate in the blood. Kris Prado, MD, UCLA Urology resident, received a Residency Research Award from the H H Lee Surgical Research Program for his study, “The Development of Chemotherapy Resistance in Urothelial Carcinoma,” which he will conduct under the mentorship of Dr. Arnold Chin. Joseph Shirk, MD, UCLA Urology resident, received a Residency Research Award from the H H Lee Surgical Research Program for his study, “Improving Decision Making and Delivery of Care in Patients with Renal Cell Carcinoma,” which he will conduct under the mentorship of Dr. Christopher Saigal. Seth A. Cohen, MD, UCLA Urology fellow, had abstracts on work surrounding the use of trans-labial ultrasound as a means to identify mesh erosions in patients suffering complications from previously attempted pelvic floor reconstruction accepted for presentations at both the Society of Urodynamics and Female Urology 2015 and American Urological Association (AUA) 2015 meetings. Alan L. Kaplan, MD, UCLA Urology resident, had a moderated poster accepted to the AUA meeting in May. The paper, “Observing shared decision-making in the urology clinic: A pilot study among men with prostate cancer,” is a product of his research year with Dr. Christopher Saigal investigating shared decision making in low-income men with localized prostate cancer. Joshua Gonzalez, MD, UCLA Urology clinical fellow, had two abstracts accepted at the International Society for the Study of Women’s Sexual Health 2015 Annual Meeting. The first, “Recurrent Ischemic Low Flow Clitoral Priapism - Update on Management Strategies,” was selected as a poster presentation. The second, “Persistent Genital Arousal Disorder (PGAD): Experience with Management in 35 Consecutive Cases,” was selected as an oral podium presentation. Andrew Lenis, MD, UCLA Urology resident, and Karim Chamie, MD, MSHS, had their manuscript,“Bladdercancerin2014:Fromthegenomicfrontiertoimmunotherapeutics,” published in the journal Nature Review Urology in February. With Drs. Alan Kaplan, Adit Shaw, and Jacob Rajfer, Dr. Lenis co-authored “Testosterone replacement therapy in men with prostate cancer: A time-varying analysis,” published in the Journal of Sexual Medicine in February. Leonard S. Marks, MD, professor of urology, was named the inaugural Chair holder of the newly established Jean B. deKernion, MD, Chair in Urology, an endowed Chair that was established to pay tribute and carry forward the legacy of Dr. deKernion, who retired in 2011. Stanley K. Frencher, Jr., MD, MPH, assistant professor and director of urology at Martin Luther King, Jr. Community Hospital, received the “Top Doctor” Los Angeles County Choice Award from his peers and employees at the MLK Outpatient Center. Steven E. Lerman, MD, professor of urology, received the 2014 Los Angeles Award in the Pediatrician category from the Los Angeles Award Program. Aaron Laviana, MD, UCLA Urology resident, received funding from the H & H Lee Surgical Research Scholarships Program to support his group’s research and development of an active surveillance program for renal cell carcinoma. The project aims to better understand when to treat such tumors – minimizing life-altering side effects while improving the quality of life for these patients. H & H Lee Surgical Research Grants provide funds to support the scholarly work of UCLA surgical residents who are completing a one- or two-year research fellowship as part of their clinical training. Sally Maliski, PhD, RN, associate professor of nursing and urology, was awarded her first Research Project Grant Program (R01) funding from the National Institute of Nursing Research of the National Institutes of Health for her proposal, “Staying Strong and Healthy during Androgen Deprivation Therapy for Latino Men.” The purpose of the study is to test a program designed to promote health for Latino men starting androgen deprivation therapy for prostate cancer through case management and mobile health strategies. Robert Reiter, MD, professor of urology, had his manuscript, “Ultra- sensitive PSA following prostatectomy reliably identifies patients requiring post-op radiotherapy,” accepted for publication in the Journal of Urology. Timothy Daskivich, MD, UCLA Urology fellow, had his abstract, “An Age-Adjusted Comorbidity Index for Prediction of Long-Term, Other-Cause Mortality in Men with Prostate Cancer,” accepted for presentation at the Society of Urologic Oncology’s annual meeting in December. His was one of four abstracts selected by the Society of Urologic Oncology’s Young Urologic Oncologists section. Alan L. Kaplan, MD, UCLA Urology resident, published “Measuring the cost of care in benign prostatic hyperplasia using Time Driven Activity-Based Costing (TDABC)” in Healthcare: Journal of Delivery Science and Innovation, a new publication being widely distributed to policy makers. The manuscript describes the application of a novel strategy to measure the cost of care in BPH. A second manuscript, “Use of patient ethnography to support quality improvement in benign prostatic hyperplasia,” was accepted for publication in the same journal. Dr. Christopher Saigal, professor and vice chair of UCLA Urology, was Dr. Kaplan’s mentor and senior author on both publications. Sally Maliski, PhD, RN, associate professor of nursing and urology, had her manuscript, “Latino men and familial risk communication about prostate cancer,” accepted for publication in Oncology Nursing Forum.